The Singareni Collieries Company Limited has received the prestigious “The Performance Excellence Award” from Indian Institution of Industrial Engineering for the year 2015. 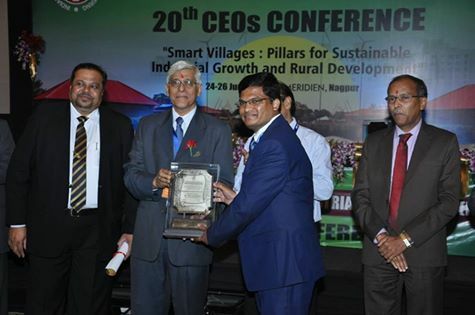 This Award is received by Sri J. Pavithran Kumar, IRS, Director (Finance) and (PA&W) on behalf of Singareni in 20th CEO's Conference of IIIE held at Nagpur on 24th June-2016. Chief Guest of the Conference Sri R.H. Khwaja, once C&MD of SCCL, presented the Award. This award is conferred on SCCL for the achievement of 15% growth in the financial year 2015-16 and for the excellent performance in Coal dispatches and Over Burden Removal etc. SCCL is the only company which recorded highest growth among all Coal Industries and Public Sector Companies. Sri N. Sridhar, IAS C&MD, SCCL expressed his happiness on getting this Award and said this is the rare honour given to the whole Singareni family who have put tireless united efforts to achieve the targets.